Research supports what we probably already knew about student collaboration: It’s integral to learning. We know that collaboration helps students build their interpersonal and social and emotional skills. We know that students don’t learn facts in a vacuum; social learning helps them build a more meaningful understanding of the world. Everyone loves collaboration. But simply bring up group work and... that’s a different conversation. 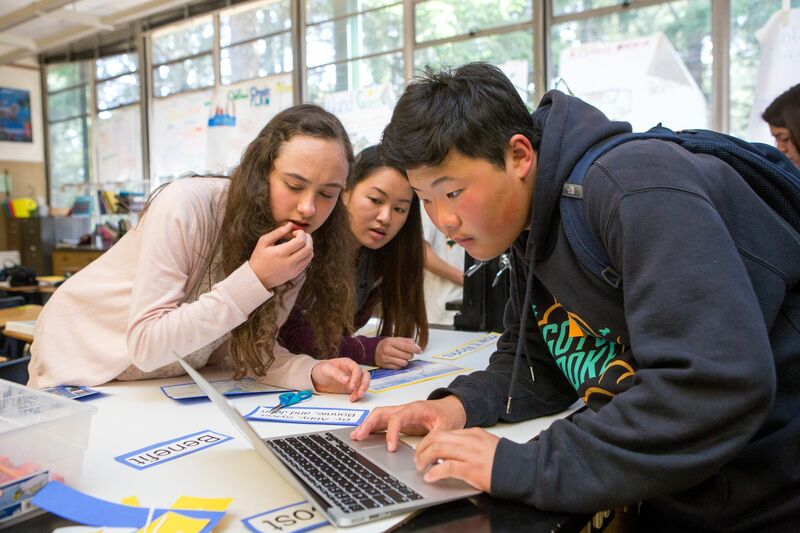 Group work is one of the most common types of student collaboration. It’s also complicated and messy, and never quite works out as well as we’d like. Some students feel like they’re doing most of the work. Others feel left out. Motivation wanes. Assignments get cobbled together, and nobody feels like they have real ownership of the work. Or worse yet: Nobody feels a strong sense of ownership of the learning. Collaborative group work is complex and messy by nature—it’s supposed to be that way. Working through that complexity is part of what we want students to experience. But if we really want to promote and model positive collaboration, it’s worth taking a second look at how we structure and assign group work to our students. If you’re designing an activity, lesson, or unit that involves collaborative group work, here are a few ideas to consider. 1. Ask yourself: Does this assignment actually need to involve group work? Can the tasks be broken down into meaningful, equitable parts? Before anything else, decide exactly what you want students to learn and make sure it’s suited to group collaboration. If the work doesn’t break down easily (and equitably), maybe it’s worth considering a different route. 2. Break down the work for students ahead of time. Effective group work takes a lot of scaffolding. Don’t expect students to know how to divvy up the work on their own. Working together to break down and delegate responsibilities is one of the most challenging tasks for any group, even for adults. Breaking down tasks ahead of time models for students how it can be done. Over time, consider transferring some of this responsibility to them. Make sure the distribution of work—what each student’s roles and responsibilities will be—is very clear to everyone. Do your best to create tasks that are interdependent—the kind that require kids to work both independently and together. 3. Give students a framework to understand their roles and responsibilities. Traditional group work roles (think: timekeeper or note taker) tend to be administrative. While that division is well-intentioned, the roles don’t (usually) serve our learning goals directly and fall short of supporting true collaboration. What if we structured the roles differently? When students share ownership of what they’re learning, everyone should have multiple roles to play: one task to own individually; a role in supporting a peer; and the responsibility to assess both themselves and someone else in their group. Interdependence is key. You can check out this graphic organizer for an example of how this might look in a group of four students. The work of collaborating in groups can be difficult to coordinate and challenging to complete. But it’s also a great opportunity to practice communication and collaboration skills. Visual brainstorming tools, such as mind maps and virtual corkboards, can help students get organized and comfortable sharing their ideas. Using a digital tool can be a big help. The three online tools below are specifically for group brainstorming. Kids can add text, videos, and images at any time (remotely or during class). And by organizing group work visually, students will develop valuable presentation skills while working creatively as a part of their team. Mural: Designed for multiple users to share ideas, Mural allows kids to work together on projects in class or remotely. Students can watch their boards grow as group members add text, videos, and images. In addition, they can move and revise items during the brainstorming process as if they were moving Post-it notes around. The paid version allows teachers to create secure rooms, or folders, to house mural boards and control sharing. MindMeister: Great for older kids, this mind-mapping website has a simple interface with extensive sharing functionality. Students can browse through premade templates or build their own map by choosing a main theme and building out nodes with notes, images, attachments, and links. Bonus: Any node can contain team assignments, due dates, and email reminders, so groups can easily visualize and organize their interdependent responsibilities. Stormboard: Students create and add “stickies” to a virtual whiteboard where group members (or a whole class) can comment and vote. These stickies can be text, images, or videos, and users can color-code and rearrange them on the board to easily organize ideas as they brainstorm.